The Grand Junction Path cuts through Cambridge from MIT’s border with the Charles River to the Twin City Plaza in Somerville, eventually ending at McGrath Highway. 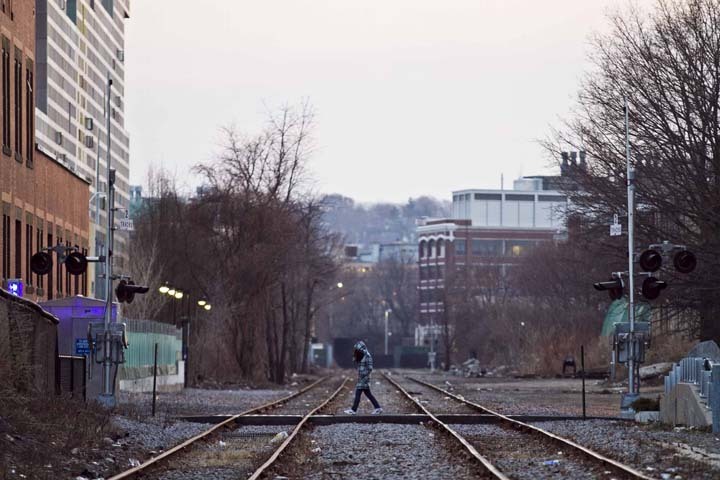 Advocates would like to see a rail-with-trail path constructed alongside the tracks to create a pedestrian and bike thoroughfare linking East Cambridge and Cambridgeport to the river. Photo by Erin Baldassari/Wicked Local Cambridge. Originally published April 18, 2014 in the Cambridge Chronicle. Rachel Burckardt has a dream. The Cambridge resident and bicycling advocate heard of a vision for a path that would take cyclists and pedestrians from the Twin City Plaza in Somerville to the Charles River at MIT in Cambridge. The route would cut through the fastest growing region of the city, connecting thousands of residents to the economic engine of Kendall Square and adding green space in areas that have long been dominated by industrial buildings and cement parking lots. At the time, Burckardt, a member of the Cambridge Bicycle Committee, took it upon herself as a civil engineer to begin drafting a “pre-feasibility” study. The path was first included as part of the city’s Green Ribbon Open Space Committee in 2000 to study open space across Cambridge and was identified as a top priority, said Cambridge Community Development transportation planner Jeff Rosenblum. A year later, the Eastern Cambridge Planning Study recommended creating the path as a key infrastructure project to encourage non-motorized transportation. In August 2001, the Cambridge Bicycle Committee completed a concept proposal for the path, which Burckardt led. 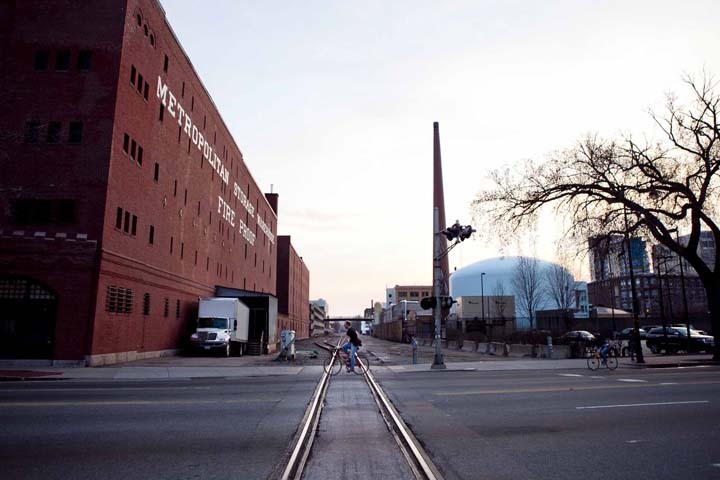 Five years later, in October 2006, the city completed its own feasibility study. Today, the railroad line has largely remained unchanged except by vandals who paint graffiti on buildings lining the tracks or litter trash or cut holes into the chain-link fencing along its borders. But, behind the scenes, advocates, politicians and Cambridge city staff have been working to convince landowners along the line to save space when new developments are built. As part of negotiations for its development of a 26-acre swath of Kendall Square, MIT committed to engaging in a feasibility study to examine building the path along its land. With a developer in Somerville committing to fund a portion of the path along its property, and the Cambridge Redevelopment Authority committing to build a portion along its land, the path is slowing inching closer to reality, parcel by parcel. “We’ve been waiting a long time, and we’ve been eager to see some facet of this actually become a reality sometime soon to make it seem more like a real project and a real path as opposed to what has largely been happening, which is something that people have been talking about,” Burckardt said. Advocates of the Grand Junction Path envision the rail-with-trail serving as a main bicycle artery cutting through the heart of the city’s busiest commercial district. Photo by Erin Baldassari/Wicked Local Cambridge. Opened in 1855 by the Grand Junction & Depot Company, the rail line snaked along the newly industrialized areas of Cambridgeport, East Cambridge, Charlestown, Everett and Chelsea, ending at the piers in East Boston. In Cambridge, there was an extensive network of “spurs,” or small side tracks that serviced the rubber, meat packing, stone cutting and soap manufacturers along the route, according to the 2001 concept plan. 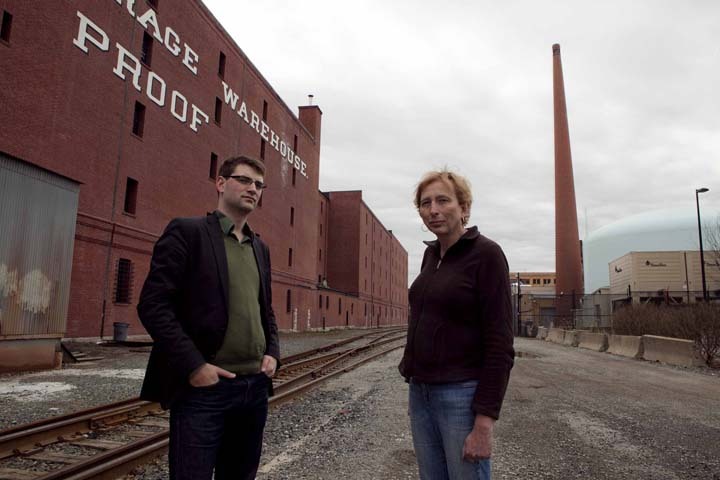 As the economy turned from industrial to high-tech, the need for freight trains diminished and more recently, MassDOT took control of the property. It’s the only North-South rail connection east of Framingham and Worcester, according to the 2001 concept plan, but it is only lightly used for freight traffic. A typical weekday sees four to six trains rumbling through the corridor, with occasional trains during weekends. Like many Cambridge residents, John Sanzone crossed over the Grand Junction railroad tracks daily with nary a thought. He happened to be attending a subcommittee meeting of the City Council in the summer of 2012 when Burckardt stood up and said the path needed a citizen group to help move it along. Sanzone heard the call and answered, stepping in to spearhead the nascent group, which he said now has about 10 core members. Over the past year and a half, Sanzone said the group has begun networking with other cycling groups in the area, took a renewed look at the feasibility studies from 2001 and 2006, and secured a seat on MIT’s committee to study the feasibility of building along its part of the path. “We’re trying to make sure the Grand Junction Path is on everyone’s radar,” Sanzone said. When the owners of the Millbrook Cold Storage site in Somerville decided to convert the property into residences last fall, Sanzone said the Friends of the Grand Junction Path were at every Planning Board and zoning hearing to make sure the city dedicated open space funds required as part of the development deal to be used for the path. Eventually, Sanzone said the path could link up with Somerville’s Community Path, which the state committed to building as part of the Green Line extension project. The community path connects to the Minuteman Bikeway and extends into Arlington, Lexington and Bedford. On the other end, the Grand Junction Path would also join with the Paul Dudley White Bike Path along the Charles River, connecting to Watertown in one direction and to communities in the Fenway, Roxbury, Jamaica Plain and Forest Hills via the Emerald Necklace. Burckardt said the path would not only provide a family-friendly path for residents of East Cambridge, Area 4 and Cambridgeport to access the Charles River, but would also offer an important commuter connection. With Harvard’s proposed science campus in Allston, Burckardt said there as an elegant synergy inherent in linking MIT’s campus on one side of the river to Harvard on the other. The Grand Junction Path cuts through Cambridge from MIT’s border with the Charles River to the Twin City Plaza in Somerville, eventually ending at McGrath Highway. Along the way, it passes through land owned by MIT, the Mass. Dept. of Transportation, and the Cambridge Redevelopment Authority. Photo by Erin Baldassari/Wicked Local Cambridge. Perhaps the biggest challenge to realizing the dream of the Grand Junction Path is getting property owners along the way to agree. The two-mile stretch is primarily owned by the Massachusetts Department of Transportation (MassDOT), the Cambridge Redevelopment Authority, and MIT, the latter of which owns a major portion of the path from Memorial Drive to Main Street. As part of negotiations to redevelop a 26-acre swath of Kendall Square, the institution convened a Grand Junction Advisory Committee comprised of representatives from the Friends of the Grand Junction Path, the city’s bicycle committee, the Cambridge Redevelopment Authority, Cambridge city staff, and MIT faculty and staff. MIT spokeswoman Sarah Gallop said the mission of the committee is to “assist MIT in a feasibility assessment of using MIT property along the Grand Junction rail line for a bicycle and pedestrian path,” but the university still has reservations about developing a path along its backside. Gallop said the university hired consulting group Kleinfelder to begin analyzing the feasibility of constructing the path along its property, which she said is expected to be completed in October this year. MIT also committed to giving the Cambridge Redevelopment Authority $500,000 to design and construct its portion of the path from Main Street to Broadway. Cambridge Redevelopment Authority Executive Director Tom Evans said plans have been in the works to redesign that section of the path for years, and the previous executive director had even secured federal funding to do so. The original plan was around $1 million and called for extensive landscaping with granite blocks and other embellishments, but Evans said they would be paring down the proposal to a more budget-friendly design. “That seemed like a lot for a path, so we’re looking at whether we can simplify the design to a more basic path and how much that would cost,” Evans said. The Grand Junction Path passes through the densely-populated East Cambridge neighborhood, connecting it to Kendall Square and the Charles River. Photo by Erin Baldassari/Wicked Local Cambridge. Complicating issues further is a single mention of establishing passenger service along the railroad as part of MassDOT’s five-year capital plan. Currently, the tracks are used by CSX Transportation for limited freight traffic, by Amtrak to shuttle trains between South Station and North Station, and by the MBTA to move trains between South Station and the Boston Engine Terminal, said MassDOT spokesperson, Kelly Smith. Smith said MassDOT is currently reviewing options for additional uses, including adding Diesel Multiple Units – or passenger cars – that could potentially make a stop in Kendall Square, but she said there is no timeline for that project. 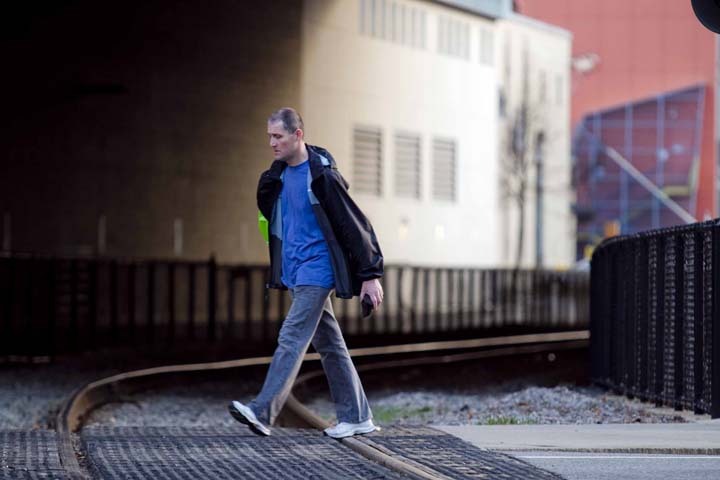 The city has no money allocated for building any portion of the path, Rosenblum said, and would instead try to tap into regional transportation funding, since the route connects multiple communities. If the city can encourage some section or sections to be built quickly, the enthusiasm of all the stakeholders and the potential for actualization increases, Rosenblum said. There is no cost estimate for completing the path since there are no designs to do so, Rosenblum said, but the 2006 feasibility study offered estimates ranging from $2 million to $10 million based on design options. The most expensive pieces, however, will be the connection across the river and to the Somerville Community Path, which must somehow navigate crossing over or around McGrath Highway, Rosenblum said. As part of the Green Line extension project, the state agreed to finish building the multi-use path in Somerville, but didn’t include a connection to the Grand Junction Path since there are no design plans to build it. Sanzone said one of the next big challenges will be securing funding to link the Grand Junction to the Somerville Community Path. On the other side of the city, Sanzone said he is working with bicycle groups in Allston to put pressure on MassDOT to ensure the path links up to the Boston neighborhood when the I-90 onramp is redesigned. Once the Millbrook Cold Storage developer hands over the open space funds to Somerville for the design of the path along that strip of the railroad, Sanzone said it could generate more enthusiasm on both sides of the city line to do more by the mere fact that something tangible exists.